A true farm-to-table meal of Grilled Pork Chops with Grilled Vegetable Medley. Fresh and delicious! 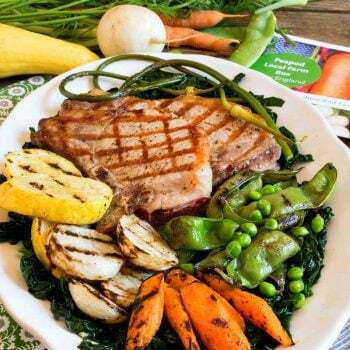 This recipe for Grilled Pork Chops with Grilled Vegetable Medley is sponsored by Peapod as part of our ongoing ambassadorship. All opinions are 100% mine. For us, summertime means grilling outdoors and cooking with fresh, seasonal produce. Especially here in New England – where the summer growing season is shorter than other parts of the country – we love to cook with local, farm-fresh ingredients whenever we can! With that in mind, we were so thrilled when our friends at Peapod asked us to develop a recipe featuring ingredients from their Peapod Local Farm Box and Peapod Local Grill Box. These boxes of locally-sourced vegetables, fruits, and meats are part of Peapod’s ongoing commitment to supporting local farmers throughout their delivery area. And the best part – you can easily order The Local Farm Box and The Local Grill Box as part of your regular grocery delivery from Peapod.com! During the summer months, Peapod has committed to buying the harvest from a collection of local farmers in advance – allowing the farmers to plan ahead and grow their business. Each week, the local farm box is different and contains produce that is freshly harvested. Inside each box, you’ll find a collection of seasonal vegetables and sometimes fruit, as well as recipe suggestions using the box ingredients. Peapod also offers The Local Grill Box, a collection of meats from local farms – all ready for your summertime grilling! All of the meats in the box are from animals that were fed a vegetarian diet and are antibiotic and hormone free. The quality of this meat is fantastic! We made these fantastic Grilled Pork Chops and served them with a Grilled Vegetable Medley – all delicious ingredients from our two locally-sourced boxes from Peapod. To learn more about Peapod’s Local Farm Box program, click here. You’ll find our Grilled Pork Chops with Grilled Vegetable Medley recipe by clicking over to From The Pod. The Hakurei turnips cook quickly (unlike its cousins the yellow turnip and purple topped turnips). This variety is mild, tender, juicy and delicious. The carrots also cook quickly. The yellow squash takes the least amount of time to cook. The pea pods in our farm box were not edible (but some other varieties are). After grilling, remove the peas and discard the pods. Pull kale leaves from their ribs by grabbing the leaves on the stem end and pulling down in one quick motion. Chop into pieces then rinse thoroughly and allow to drain in a strainer. In a large sauté pan, place two tablespoons of olive oil and cook garlic over medium heat for 1-2 minutes. Increase heat to medium high and add wet chopped kale (careful – it will splatter) and cook covered for two minutes. Remove lid, stir and cook for two more minutes. Toss with butter and pepper and set aside. Preheat grill to high. Brush all sliced vegetables with oil, salt and pepper. Brush pork chops with oil, salt and pepper. Grill pork chops for about 2-3 minutes per side or until done. At the same time, place all vegetables on the grill* and grill until tender (timing varies between 8 and 15 minutes**). Remove each vegetable from the grill as they become tender. *The pea pods and garlic scapes should be cooked in a grill basket. To serve, place cooked kale on a platter, top with the pork chops and surround the platter with each cooked vegetable.